France's Oliver Giroud is often labeled as 'underrated' with lack of much-deserved acknowledgment. In the wake of his goal which made him the third highest goalscorer in France's history, we take a look at his illustrious career overshadowed by the expectations of modern football. Chelsea forward Olivier Giroud has now become the third-highest goal scorer in the history of France football. In the Euro Qualifiers match against Iceland, Giroud scored found the back of the net in the 35th minute of the match, taking him third on the top scorer’s list, only behind Michel Platini (41) and Thierry Henry (51). Often regarded as ‘underrated’ by fans and critics, Giroud has had a very impressive career already. During his time at Arsenal football club, where the Frenchman was roped in for just 12 million euros — a low price tag in the modern football transfer market — from Montpellier in 2012. He averaged 20+ plus goals a season with over 100 goals for the North London club in his five-year tenure there. Prior to his Arsenal move, he also led Montpellier to the French title and won the golden boot that season (2011-2012). 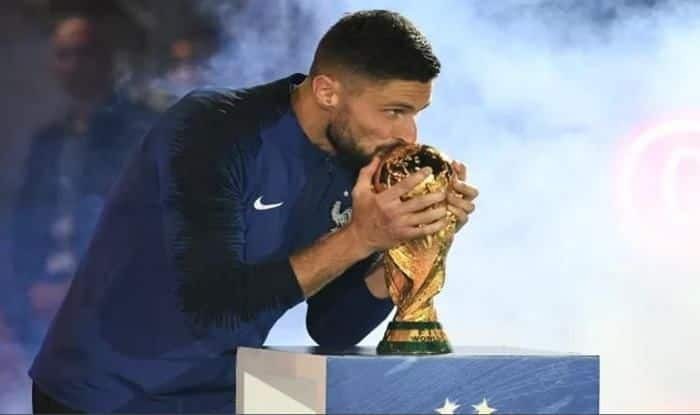 Earlier last year, Giroud also played a crucial role and featured in all of France’s matches in the FIFA World Cup tournament. His interlink ability is often hailed by teammates and managers. This season, after joining Chelsea in the winter transfer of January 2018, Giroud’s appearances at club level have been reduced to mostly cup competitions like Europa League and FA Cup. Lack of games has also sparked rumors of a possible transfer away from the ‘Blues’ with strong links emerging from Ligue club Lyon and even a possibility of a return to former club Arsenal. Football is a game, where the talent of strikers is mostly measured by the number of goals scored, more than anything else. Despite having a decent record in his limited appearances so far, Giroud is often criticized and still not in the list when pundits and fans talk about ‘great strikers’. His strong passing and build-up play, apart from goals, is what makes him a complete player. The 32-year-old still has some time on his side before retirement and at his current rate, he could very well surpass Platini to become the second-highest goalscorer in France’s history – something no pundit or fan would have ever imagined. It is about time we start giving the big man credit for his grit and determination, which is exemplary to all those who aspire to become forwards in the beautiful game.